slavery – Page 2 – Mark Loves History! Frederick Douglass dies of either a heart attack or stroke in Washington DC after having appeared at an event of the National Council of Women where he received a standing ovation. Thousands paid their respects at his funeral before he was returned to New York City to be interred at Mount Hope Cemetery in his family plot. Douglass had been born circa 1818 (he never knew his actual birth date) into slavery in Maryland. In 1838, on his third attempt, he escaped slavery. In the coming years Frederick Douglass became a well respected orator and statesman for the growing abolitionist and equal rights movements, impressing his listeners with his intellect and powerful messages. “I have often been asked, how I felt when first I found myself on free soil. And my readers may share the same curiosity. There is scarcely anything in my experience about which I could not give a more satisfactory answer. A new world had opened upon me. If life is more than breath, and the ‘quick round of blood,’ I lived more in one day than in a year of my slave life. It was a time of joyous excitement which words can but tamely describe. 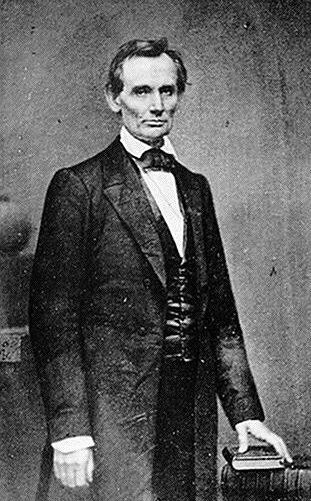 One day after Congress passed the Thirteenth Amendment to the US Constitution, President Abraham lincoln signs the act outlawing slavery. It would take until December of the same year for enough states to ratify the amendment so that Secretary of State William Seward could proclaim it the law of the land. Of course Lincoln would give his life the cause of Union and freedom before then. Today in History, June 5: 1851 – “Uncle Tom’s Cabin”, or “Life Among the Lonely”, by Harriett Beecher Stowe is first published in an abolitionist weekly magazine. The story brought the life of a slave to the masses when a publisher picked it up and printed it in book form, making it an international sensation. The book set afire the slavery / anti-slavery camps in the nation. In 1862, when President Lincoln played host to Ms. Stowe in the White House, he is reported to have greeted her with, “So this is the little lady who made this big war?”. In book form, Uncle Tom’s Cabin would be the number one bestseller of the 19th century, except of course for the Bible. Go West, Young Man, and Grow Up With the Country! 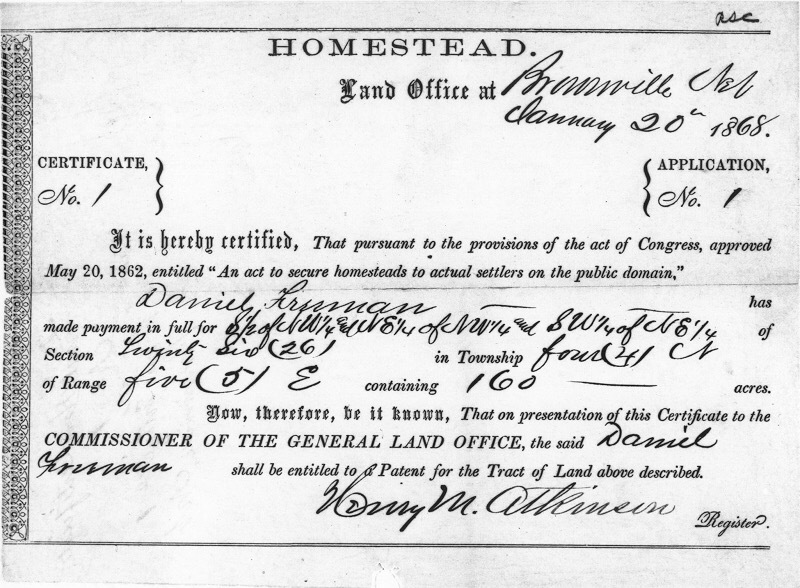 Today in History, May 20: 1862 – President Lincoln signs the Homestead Act, which would give 160 acres of western lands to anyone that would farm it successfully for 5 years and build a residence upon it (often a sod building). The Act would encourage vastly expanded settlement of the west; bad news for Native Americans, good news for those newer Americans wanting to improve their lot in life. Congress had attempted to pass similar acts in 1852, 1854, and 1859, but each time the attempts were shot down by Southern Democrats who were afraid that if the west were populated by poor farmers and immigrants it would result in more “free” states, which would result in more votes against slavery. Once the Republican Lincoln was elected, and the Civil War began, the Southern Democrats were no longer part of the equation. As their states seceded from the Union, their obstructionist votes left Congress. 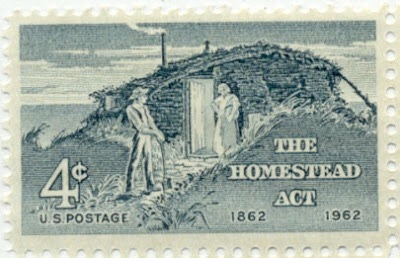 The Republicans soon passed the Homestead Act and the settlement of the west began in earnest. By the end of the war 15,000 settlers (some of which were merely pawns for land speculators) had accepted their lands. Eventually 80 Million acres would be settled. Today in History, March 14: 1794 – You never know what your legacy will be. Eli Whitney is granted a patent for his cotton gin (engine), although the patent wouldn’t be free and clear of legal suits until 1807. Whitney was emigrating south to S. Carolina when a fellow passenger, the widow of Revolutionary War hero Gen. Nathanael Greene, convinced him to go to her Georgia plantation instead. It was here that he and his partner, with help from Mrs. Greene, would develop the machine that changed the process of removing seeds from cotton from laborious to simple. As a result of Whitney’s innovation the South’s cotton exports went from less that 500,000 lbs in 1793 to over 93 million in 1810. It had another effect not intended. Slavery had been of waning use in the late 18th century…but with “King Cotton”, the Antebellum South’s burgeoning economy needed labor, and slavery became an integral part of their livelihood, dashing the hopes of those abolitionists who expected it to die out. In the meantime…all of the legal wrangling over his invention left Eli broke. So to make money he turned to making weapons for the government. While he was not the originator, he was an avowed proponent of using inter-changeable parts…which would eventually influence the industrial revolution. So…both of Whitney’s successes greatly influenced (contributed to?) the Civil War and the nation’s development long after his death in 1825. The Civil War began about state’s rights…but about the right to keep slaves by those states. Expansion westward in the South was mostly about beginning new plantations…hence more slaves. And I’m sure many of Eli’s muskets survived for use in the war. None of which was likely on this little known inventors mind as he worked his trade. Today in History, March 6: 1857 – The Dredd Scott Decision. Dredd Scott was a slave whose owner had traveled and lived in “free states” and had promised him his freedom. When his owner died, Scott sued for his freedom, because he had lived in “free” states. The case worked it’s way up the chain to the Supreme Court, which at that time was loaded with Southerners. Chief Justice Roger Taney wrote the majority opinion that declared that no slave could possibly be a citizen, therefore they had no standing to sue. Also that the Federal Government had no right to regulate slavery in the states and territories. Obviously a biased, politically motivated opinion, the decision, in part, led to the horrific, devastating American Civil War. So our lesson is complex. The Supreme Court, while our highest court, is not infallible. It’s bad decisions lead to horrific consequences for the nation. It DOES make political decisions. And this theory does not end with Dredd Scott. One has to wonder what Roger Taney was thinking when he had to swear President Abraham Lincoln in to office in his position as Chief Justice of the Supreme Court. He forever tainted and brought into question decisions made by the Court. 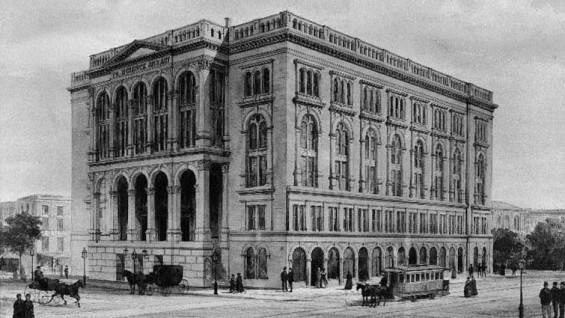 Today in History, February 27: 1860 – “One of the most happiest and most convincing political arguments ever made in this City … No man ever made such an impression on his first appeal to a New-York audience.” — Horace Greeley in his paper regarding “The Cooper Union Speech” by Abraham Lincoln. 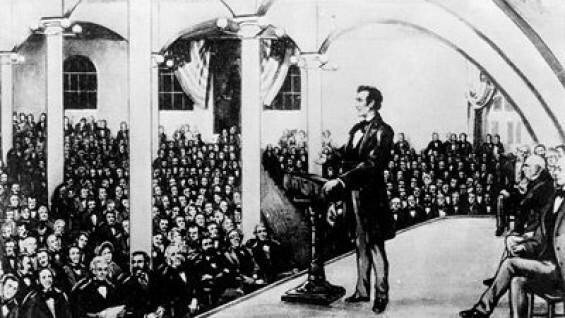 A former Congressman and Illinois lawyer, Lincoln had been launched to the national stage by his debates with Stephen Douglas over the slavery question 2 years before, but he was still mostly unknown in the east. A young Republicans group in New York invited him to speech at Cooper Union’s Great Hall. The hall was not filled for the speech, but the text of it was given to Greeley’s and other’s papers; from there it was broadly published across the nation in pamphlet form. Lincoln made convincing arguments that the Founding Fathers were against the expansion of slavery and desired it’s eventual end. At the same time he tried to convince Southerners that the Republican party did not wish to interfere in their affairs. While in New York he had his photo taken by Matthew Brady, and the photo was used along with the pamphlet to broaden his recognition. It is widely believed that the speech is what launched him into the Presidency. He closed with a message to his colleagues: “Neither let us be slandered from our duty by false accusations against us, nor frightened from it by menaces of destruction to the Government nor of dungeons to ourselves. Let us have faith that right makes might, and in that faith, let us, to the end, dare to do our duty as we understand it.” (See below for video of Sam Waterston performing the speech).